Depending on your analyte, lack of deactivation in your inlet can show up as a loss of detector response as seen in figure 2, or poor peak shape as in figure 3. 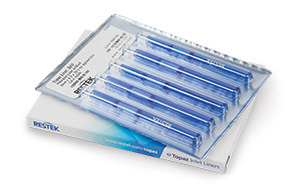 Low detector response is seen when reactive analytes break down easily on contact with active sites in the liner. 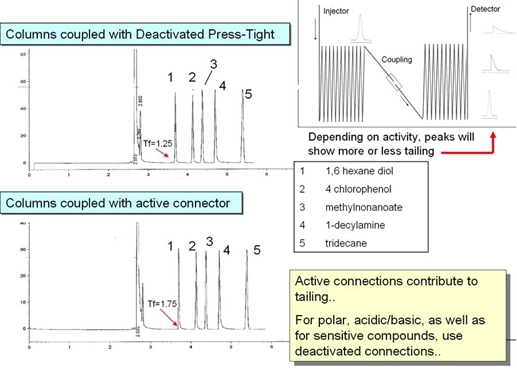 In figure 2, the only sign of breakdown is the loss of 2,4-DNP response, but with some analytes, degradant peaks appear in your chromatogram. Their peaks are typically well shaped as there is no adsorption to delay their introduction to the column. injector. The problem appears as tailing, but the overall peak area is usually not affected. At high analyte concentrations, this effect is mostly a nuisance, but as analyte concentrations approach the limit of detection the lower broader peaks are far more affected by system noise. Improved response for polar, acidic, and basic compounds. Symmetrical peaks for even active compounds such as pyridine, easy to determine the end of the peak. Increased signal-to-noise ratios to improve low-level detection. Narrow peaks without tailing concentrates the signal, raising it further above the noise. 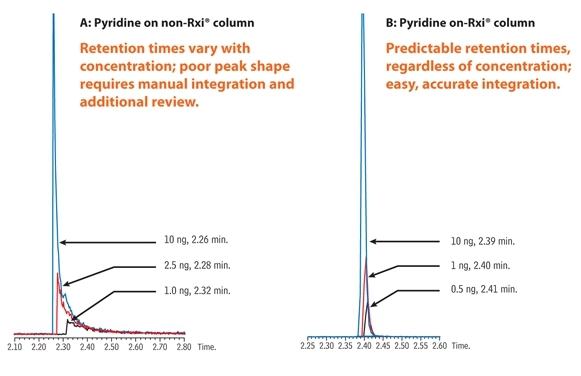 In the example below, the 0.5ng injection of pyridine provides greater signal to noise ratio on the Rxi column than the 1ng injection on a non-Rxi column. Stabilized retention times for positive identifications. At extremely low concetrations, active sites affect enough of the sample to shift the entire peak off the expected retention time. Not all column deactivations are appropriate for analyzing basic compounds. In this application note we demonstrate the effect of column inertness on peak shape, and discuss its role in improving method accuracy, sensitivity, and development time. When you set up a GC, column connectors are usually the last thing you think about. They add very little surface area compared to columns, and are typically glass or fused silica, normally inert materials. Even so, deactivated connectors are crucial to overall performance. In the experiment below, the same columns were coupled with a standard deactivated press-tight and with a plain glass press-tight. The additional tailing is not huge, but for the active peaks such 1,6 hexane diol, there was enough adsorption to increase tailing from a very comfortable 1.25 to 1.75, close to the acceptable limit for many methods. Note that peak 5, tridecane, is not affected by the change of liner, confirming that the tailing of other peaks is a result of chemical rather than physical differences in the connection. Once you have safely shepherded your sample through injection and separation, your detector can still degrade your analytes before you measure them. To demonstrate the problems of active injector sites in a detector, Restek chemists simulated FIDs with varying degrees of activity in the flow path by moving the tip of their column higher and lower in a standard FID jet. 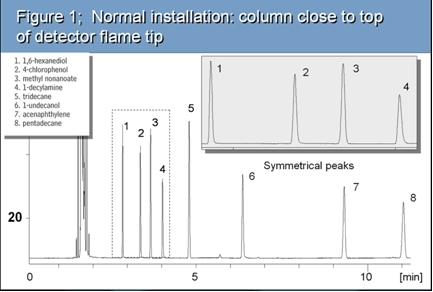 With normal column installation, all peaks were symmetrical (figure 2). 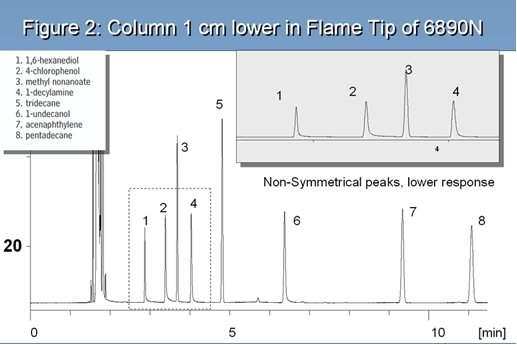 When the column was installed 1cm lower than the proper position, the sample was exposed to more active sites on the hot steel wall of the jet, causing active analytes to tail (peaks 1-4 and 6). Non reactive alkane peaks remained symmetrical, indicating that the observed tailing was not a result of a poor physical flow path. 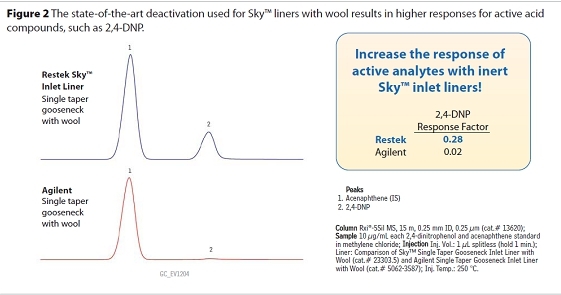 For many analytes, proper column positioning is sufficient to prevent peak tailing, but with the most active analytes Restek’s Siltek treated FID jets put a combination of high purity silica and an organic deactivation layer between your sample and potential catalytic or adsorption sites in your detector. Rxi®-624Sil MS, Rxi®-35Sil MS, Rxi®-17, Rxi®-17Sil MS, Rxi® guard/retention gap columns. - Siltek® - the ultimate passivation of treated surfaces, from glass to high nickel alloys of steel; ideal for sulfurs, automotive exhaust testing or stack gas sampling. - Sulfinert® - a required treatment for metal components when analyzing for parts-per-billion levels of organo-sulfur compounds. - Silcosteel®-CR - a corrosion resistant layer that increases the lifetime of system components in acidic environments containing hydrochloric acid, nitric acid, or seawater. 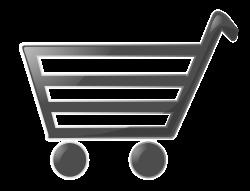 Many other treated/inert fittings are available.